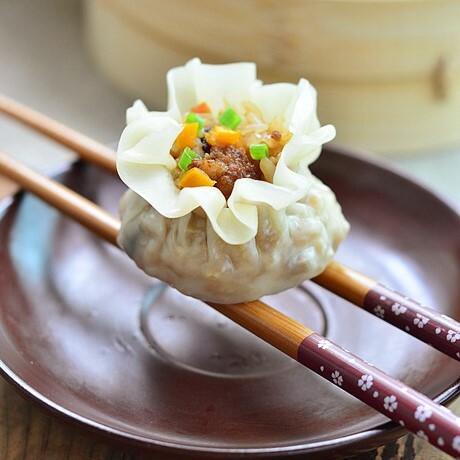 After I made the first batch of successful Har Gow, I was in love with the crystal dumpling wrappers. The dough is much easier to knead than normal dumpling wrapper dough. 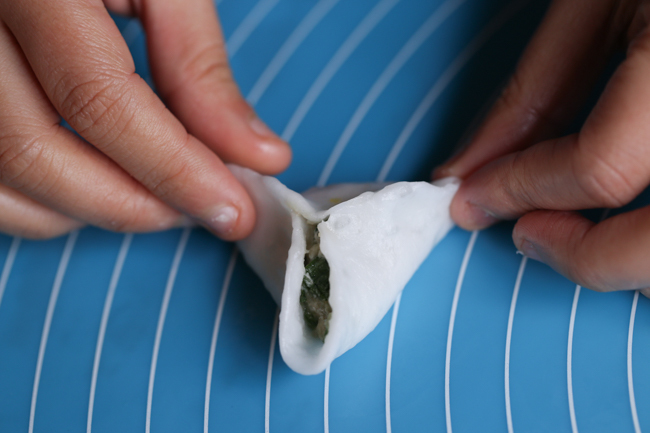 And more importantly, the chewy and elastic wrapper gives the dumpling a very special texture. Comparing with har gow dough, I use more potato starch in the dough, which creates a more transparent and chewier wrapper. 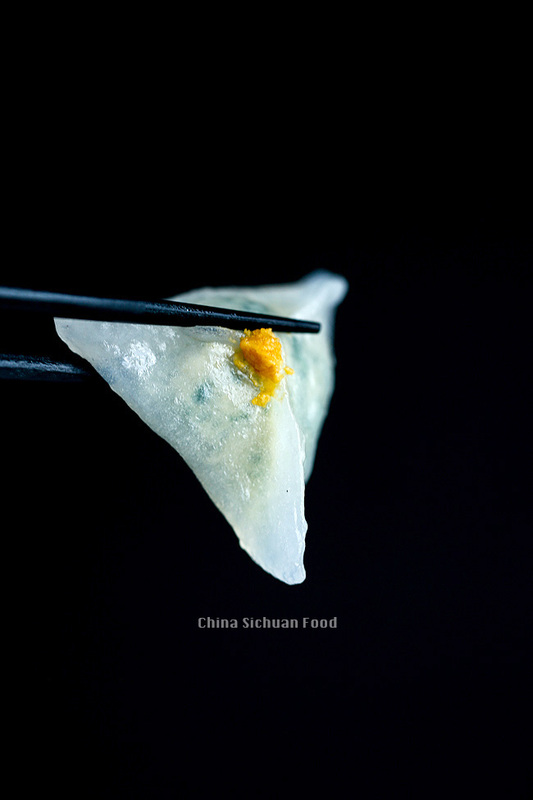 So for those who love a more transparent har gow, use this dough to make your shrimp dumplings. 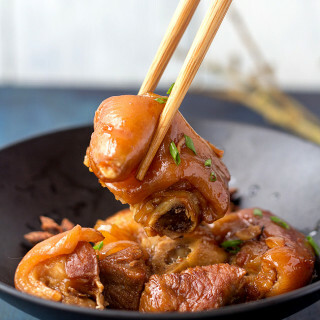 Mix salt, crack an egg and pepper with pork in a small bowl. Get another large bowl, mix chopped chive with sesame oil. Then mix well with pork. Cover and fridge. 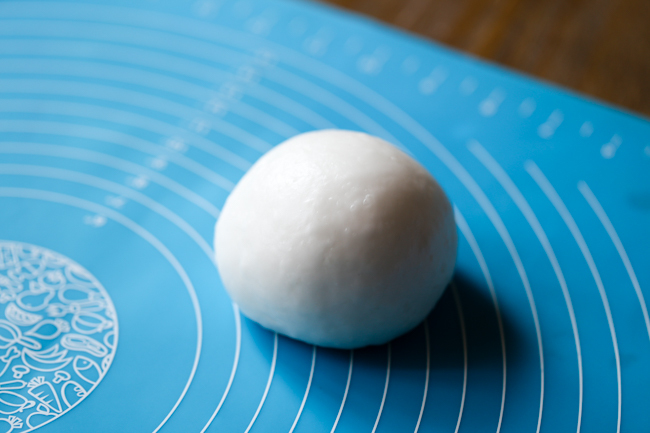 On a kitchen scale, weight 100g of potato starch+ 25g of wheat starch in a large mixing bowl. Mix with a small pinch of salt. Then stir in 125ml boiling hot water. Cover the lid and set aside for 5 minutes. Transfer to an operating board and knead until smooth. Cover with a wet cloth and rest for 10 minutes. Shape the dough into a long log and then divide into 12 portions. 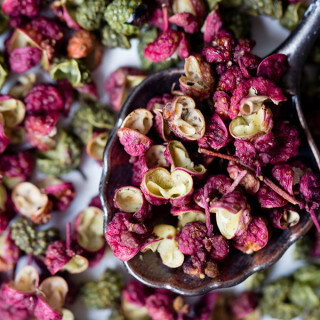 Take one portion out and press into a larger circle, fill with 1 tablespoon of filling and wrap as a pyramid. Following video shows the process of making a pyramid dumpling. Repeat to finish all. 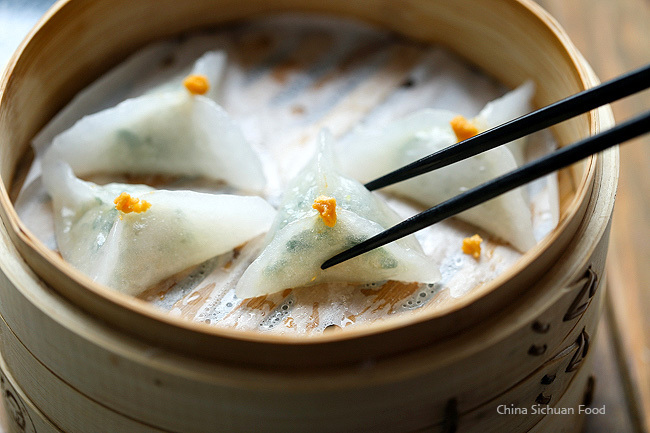 Top each one with salted duck egg yolk as decorating. 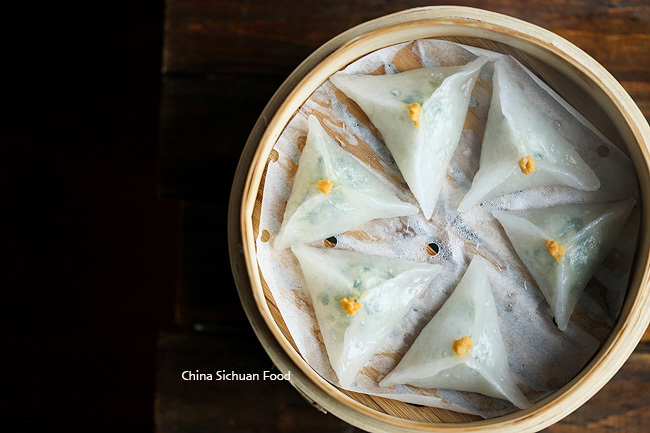 Set up steamers with lined papers and then brush a thin layer of oil on the surface (so your dumplings will not stick to the paper). 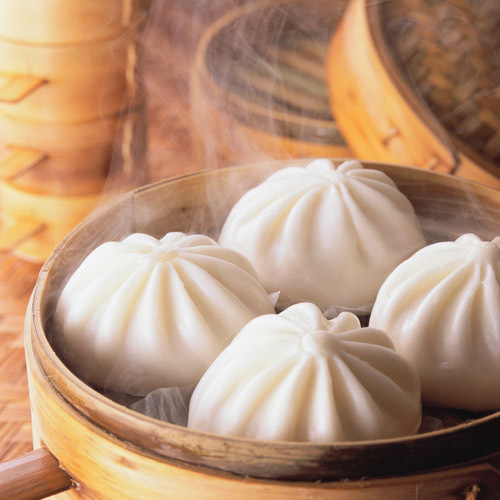 Bring water to a boil in a large pot to steam the dumplings for 6-8 minutes. Serve hot! 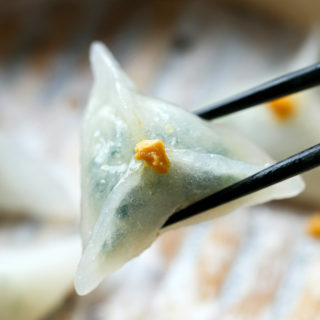 You do not need to prepare a dipping for this pyramid dumpling, but you can prepare a small bowl of red vinegar in any cases that dips are strongly desired. 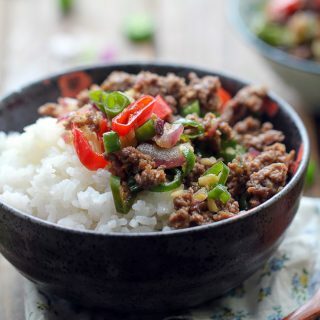 Mix salt, egg and pepper with pork in a small bowl. 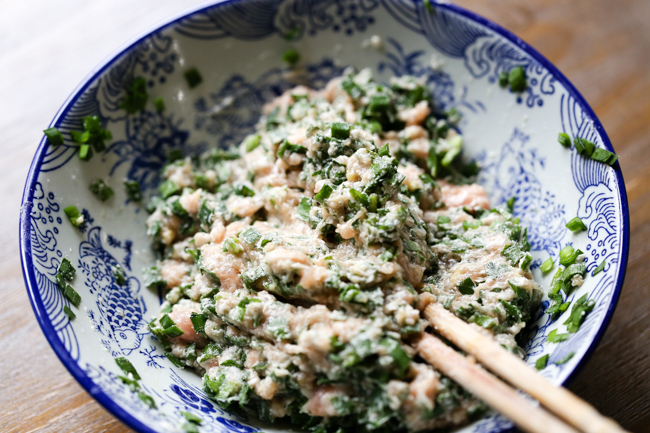 Get another large bowl, mix chopped chive with sesame oil. Then mix well with pork. Cover and fridge. Covered and rest for 10 minutes. Shape the dough into a long log and then divide into 12 portions. Take one portion out and press into a larger circle, fill with 1 tablespoon of filling and wrap as a pyramid. The Nutrition Facts is based on each single crystal dumpling. 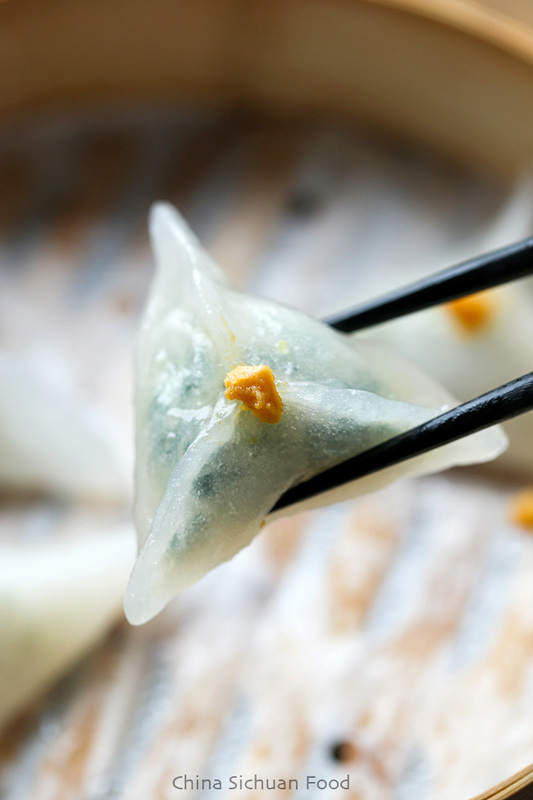 I’d love to be able to make your beautiful crystal dumpling wrappers (with an altered filling inside, as I’m vegan), but I have no way of getting any wheat starch. I do have potato starch. 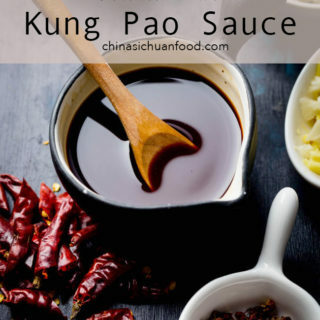 Is there any chance there is something suitable to use in place of wheat starch? Some of the ingredients I do have are: tapioca starch, corn starch, high gluten flour, white cake and pastry flour. Would I be able to use any of these as a substitute for the wheat starch? 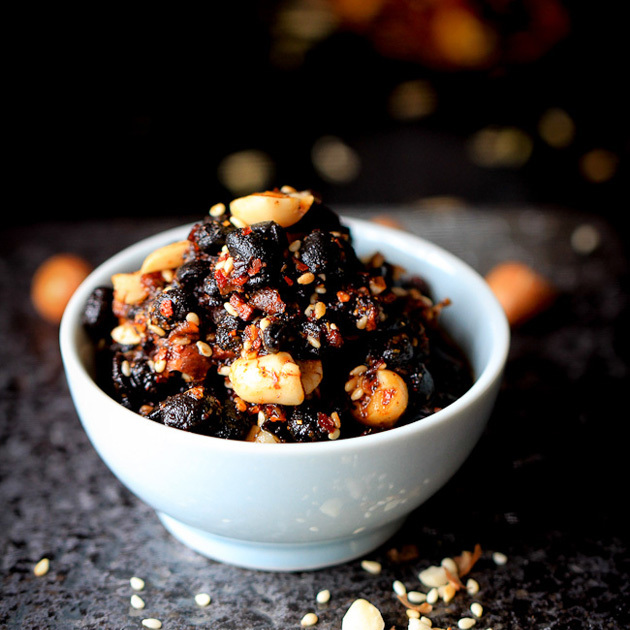 I realize I will not be able to get the same results without wheat starch, but if you have any advice on how I could attempt to make this with what I have, I’d be ever so grateful. Please do let me know. I so appreciate all of your amazingly photographed, great recipes. Wishing you a most wonderful new year filled with happiness, good health, and good luck! Thanks for much for your kindness. Wheat starch can be substituted by tapioca starch. Tapioca will produce a very similar result. Happy cooking! You are, also, a great photographer, Elaine! I could not find the egg or eggs in your filling ingredient list. I’m about to make your recipe so I will wisk one egg before adding to the pork mixture. Thanks for your beautiful work! I lost the egg in the ingredient list. 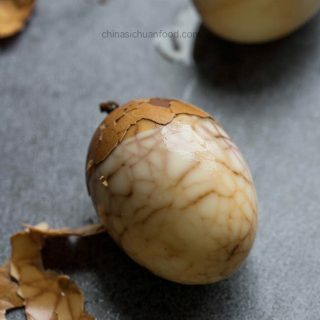 Just crack the egg and mix well with filling. This is so delicious. I made it last sunday when my friends came over and they were all impressed. I must admit I thought at first it would be too dificult for me, but it ended up being easier than I imagined. Thank you!